Concrete is a composite material consisting of cement, sand and water in suitable proportions. 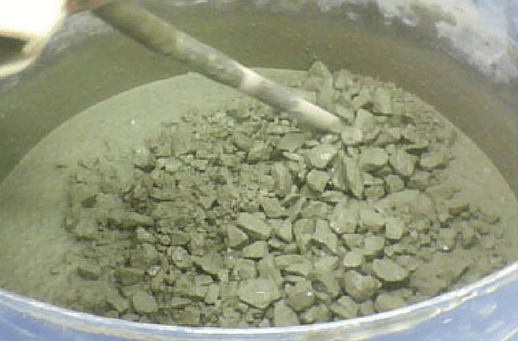 The chemical interaction between cement and water binds the aggregate. 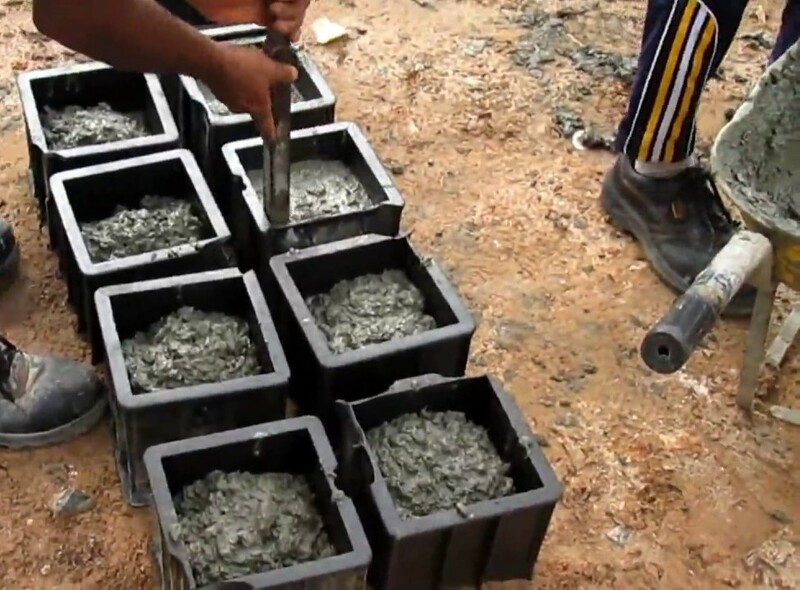 Fresh concrete will be plastic so that it can be moulded to any desired shape and compacted to form a dense mass. Concrete should be placed in a position before it starts losing its plasticity. The time at which concrete completely lost its plasticity and became hard is called final setting time of concrete. 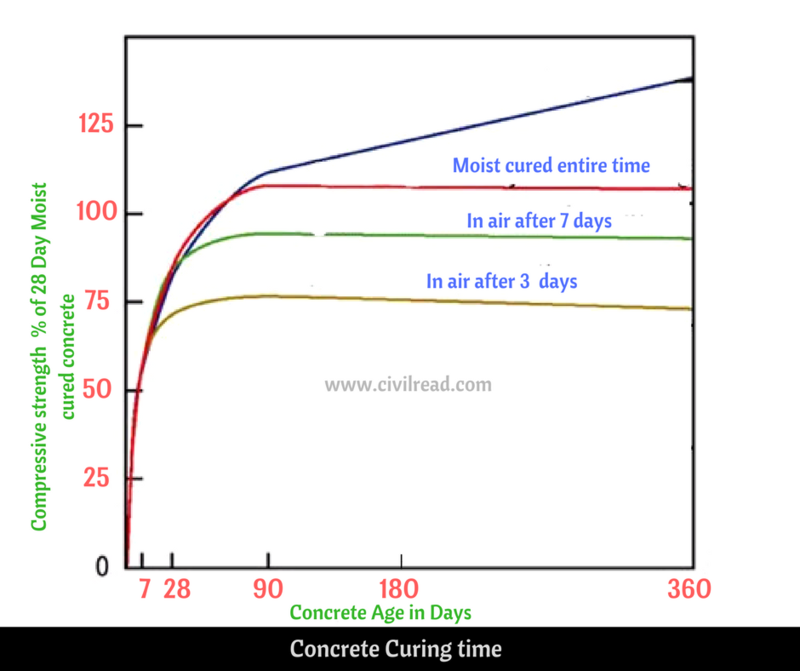 What is the curing period of concrete? Minimum curing time for cement concrete? The reaction between cement and water is called hydration. Its an exothermic reaction (which releases heat). After adding water to the concrete mix hydration starts, which makes concrete to dry out due to an exothermic reaction which releases heat. In order to complete the hydration reaction concrete is kept moist. Curing plays a vital role concerning concrete strength development and durability. After adding water to the concrete mix (Cement, Sand & Aggregate), the exothermic reaction (hydration) takes place which helps in concrete to harden. As hardening of concrete is not instant and continues for a longer period which requires more amount of water for processing hydration. To accommodate this, concrete is kept moist till the hydration reaction completes. This process is called curing of concrete. Curing is the process in which the concrete is kept moist to protect it from loss of moisture due to atmospheric temperature and hydration reaction. Curing is the process of controlling the rate and extent of moisture loss from concrete during cement hydration. As there are many frequently asked questions about curing of concrete. Here i am discussing all your queries and imported them in a single article. Water is to be applied for few days over the concrete surface soon after its setting because the hydration reactions between cement and water continue for a more extended period due to which hardening of concrete takes place. Curing is done by draining water to the surface of the concrete. Water cooler than 50C should not be used for this purpose. As the hydration reaction in concrete expells heat and keep concrete warm, Using cold water less than 50C on concrete may lead to cracking & also alternate drying and wetting on the concrete surface causes volumetric changes and leads to cracking. The minimum period for curing concrete to attain maximum strength is 28 Days. For clear understanding, check the below graph. Early strength of concrete is more important, and it is responsible for the ultimate strength of concrete. We should do proper curing as per the environment condition, type of member, etc. Maintaining the proper temperature also plays an important role in concrete as mentioned, it should not be cooler than 50C. It is recommended to keep concrete moist for 28 days. Nowadays Due to lack of time, the curing can be achieved by following modern techniques in 14-20 Days. But it is always recommended to keep concrete moist for at least 14 days. As per IS 456 – 2000 concrete should not be cured less than 7 days for ordinary Portland Cement, & it must be at least 10 days for concrete with mineral admixtures or blended cement are used. In case of hot weather and very dry temperature conditions, the curing should not be less than 10 Days for OPC and 14 days for concrete with blended cement & mineral admixtures. Due to the chemical reaction between cement and water in concrete releases heat which requires water to complete hydration. In summer 50% of water is evaporated. So, More amount of water is required during sunny days. Well, many practices are followed to keep concrete moist. Here I’m discussing the following techniques which prominently used. 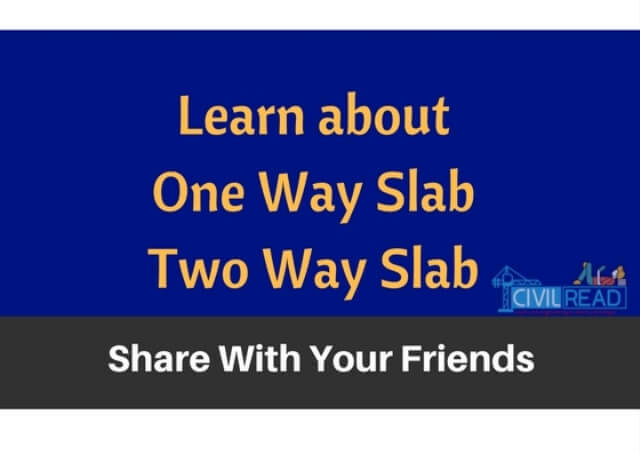 This method is adopted in floor slabs. Small ponds on slabs are made, and these ponds are filled with water continuously for 14 days for curing concrete. 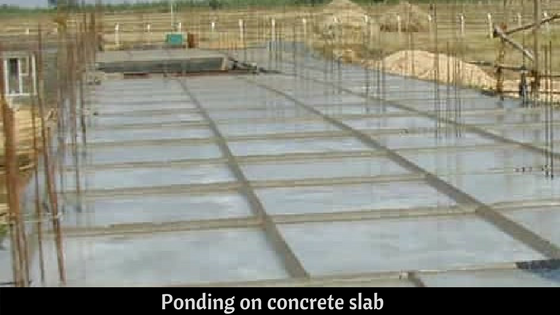 This type of method is adopted for columns, footings and bottom surface of slabs where ponding is not possible. 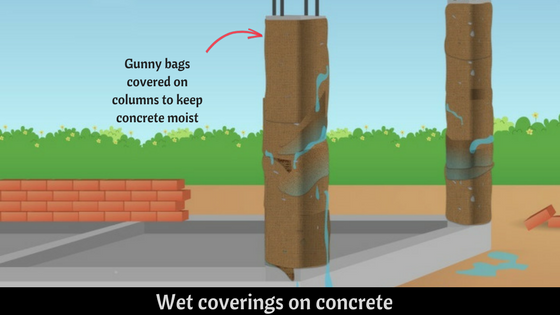 Impermeable coverings like gunny bags or hessain are used to cover the concrete; these membranes are wetted to keep concrete moist. 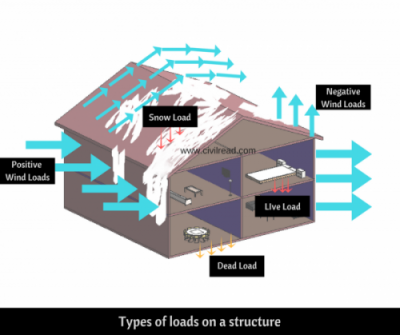 you make it easy for non-civil engineering to understand. Thank you sir. Information is very easy to understand. Thanx sir this information is very easy. 1) BILLS OF QUANTITIES (B.O.Q). 2) BILL OF QUANTITIES AS PER CSI DIVISION. 99% of the students don’t know that what actually the syllabus is for Gulf job Oriented.